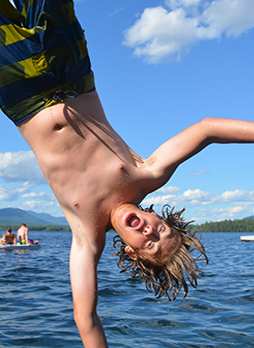 Camp Deerwood is a place where boys have fun, make life-long friends, learn new skills, and gain independence and confidence - all in the beautiful setting of Squam Lake and the White Mountains of New Hampshire. The campers participate in a well-rounded program of challenging activities without undue pressure. The atmosphere is friendly, electronics-free and conducive to achieving some surprisingly good results. Started in 1945 by Ferris & Helen Thomsen, Deerwood is run by the third and fourth generation of Thomsens and a strong core of senior counselors. If you would like to learn more about our camp or apply for an upcoming session, please use our Request Form and we will send you more information.